I usually food prep over the weekend or at least on Monday’s when I have the house to myself, but with the holiday weekend, the task of prepping my food for the week and meal planning was on my To-Do list for today. This simple, weekly routine has helped keep healthy eating on our radar and not an afterthought. It’s also a great way to save money by making sure you use up all the items you purchased during your last trip to the market. We are huge vegetable eaters and I always try to incorporate fresh, local produce into almost every meal. By the end of the week, there’s always little baggies and containers with left over pieces of random vegetables, along with things that we still haven’t gotten to eat. These are the items that I begin my prep with. My go to recipes for any leftover vegetables is Ratatouille or simple roasted vegetables. Both methods are low in fat and can be used in multiple ways. Salt, pepper, quality EVOO, and robust, quality herbs and spices produce a fresh and aromatic dish. This prep usually takes about two hours from start to finish. Being organized is key. I pull out all of the fruits and vegetables that are in the refrigerator, the rice cooker, and (in the winter) my George Foreman grill. In addition, I’ll grab any other leftovers that were in the fridge. I toss what I know I won’t use in the trash and incorporate what will pair well with something else. Onions, peppers, broccoli, cucumbers, celery, zucchini, brussel sprouts, carrots, tomatoes, green grapes, and a pear. I also had a leftover container of rice, quinoa, a grilled chicken piece, and some roasted chicken breast. Sidenote: I try to only have pasta, beef and/or pork once a week, the rest of the time it’s chicken. I like to purchase organic when I can and it’s usually a whole roaster chicken, boneless skinless breast, and/or thighs. Many people tell me that they get bored with chicken, but you just have to really work with your spices and sides to create different dishes. Think ethnic! Pre-heat oven 350 degrees for roasted chicken / 400 degrees for vegetables. (I have a double oven, so I can have two ovens going at one time). Rub outside of chicken with quality EVOO, salt, pepper, herbs/spices of your choice. Place chicken in 350 degree oven for proper amount of time for it’s size. Season chicken breast and grill on the George Foreman grill. I will also boil a few chicken breasts in chicken broth to create shredded chicken for salads and soups. This will generally give me the base for my packed lunches for the week and a stockpile of sides for dinner (vegetables and rice or quinoa). The roasted chicken will be a dinner for one night of the week and any leftovers will be chopped up or shred. The grilled chicken can be cut up for lunches during the week or tossed into a Mexican dish for dinner another night. Here’s what I did this week with the leftover chicken I had in the refrigerator. There’s always a bottle of hot sauce in the house, so I tossed 1 Tbsp into the Ziploc with the chicken, added some chopped up celery and stored it in a clean container. This will be added to the Romaine lettuce that’s already prepped in baggies for someone’s lunch or a dinner on the go. You can add some crumbled blue cheese or dressing if you don’t mind the extra calories. I chopped up some leftover roasted chicken (about 3-4 cups) we had last week and added about 3 ½ Tbsp. of light mayo to it. Mayo is not the healthiest food around, but I love this salad and I don’t eat it every day so I don’t fuss over that too much. If you can make your own mayo, that’s a much better way to go. Next I toss in 1 Tbsp. of Curry. You can use any kind of curry, but I love fresh herbs and quality spices – they are worth the extra cost with the punch of flavor they add to your food. Curry has a tendency to soak up the moisture in this dish and you may want to add more mayo. I choose to use no more than the 3 Tbsp. of mayo for health reasons, but after I add the seedless grapes and toss this on top of my Romaine, I’m quite satisfied. We use the additional shredded chicken for this great soup. Click on the link above for a pretty close recipe to what we use. We add crushed tortilla chips on the top and some warm cornbread muffins for a quick but hearty weeknight dinner. Last week I purchased three cucumbers that I forgot about. They are just starting to get soft. Because I’m picky with my cucumbers, I chose not to cut them up for my salad, but created a pickled salad that my grandmother used to make when I was a kid. It’s super simple – cut the cucumbers thin, add a little salt, and white vinegar (to taste). I had three cucumbers and used about ½ cup of white vinegar. My grandmother would squish the cucumbers up with her hands and just let them sit for several hours. This lends well to using cucumbers that can be soft. This makes a great side dish. I know others who have added thinly sliced red onion to this as well. When all of my food is prepped, I create at least 4 containers for my to-go lunches. I line the bottom with either some brown or whole grain rice or quinoa, added roasted vegetables and some grilled chicken. I pack up what’s left of the vegetables and grains in separate containers to use for weeknight dinners. 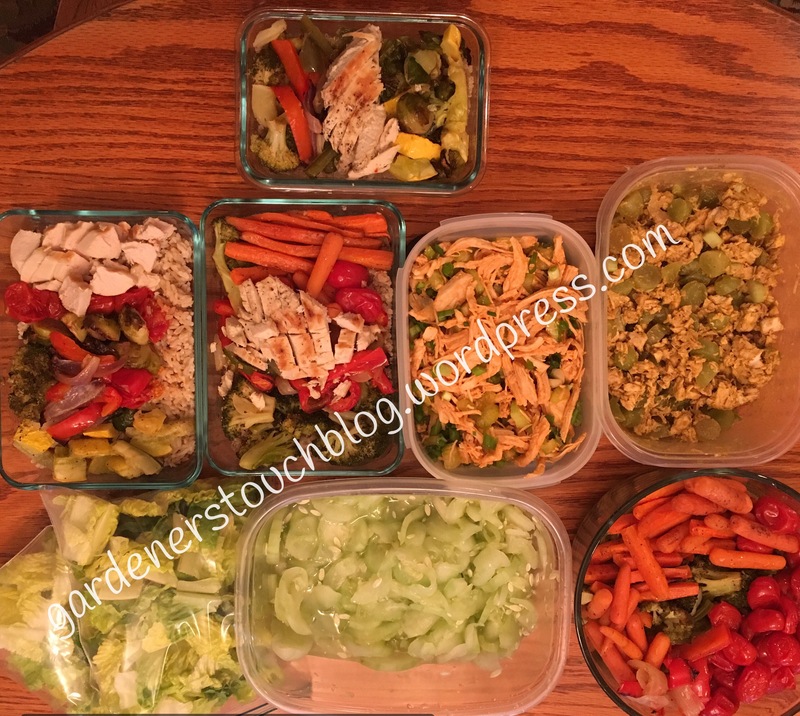 Two hours – start to finish – happy and healthy meal prepping! So grateful that the good, green, earth produces what we need to live a healthy life. We are always provided for.